New house, new studio, and hitting the road! I've been keeping it quiet over the past month or so, but we are currently in the process of buying our first house! It's been a long road and we haven't finalized it yet, but I think it's safe to say we will definitely be moving soon. This means lots of packing, unpacking, messy rooms and 'where is that thing' and 'what box was that in' happening. The good part about this - well, aside from our own house - is that the studio will be in a bigger room than ever before! It's not absolutely huge so don't imagine a warehouse or anything, but it's going to be amazing the amount of extra space it will offer, and with that more possibilities for expansion! I've always wanted a high quality wide format printer and now that's actually a future possibility. Starting May 7th, the shop will be closed while everything gets packed up, and very likely will not open until June 29th. If I am able to open earlier it will. 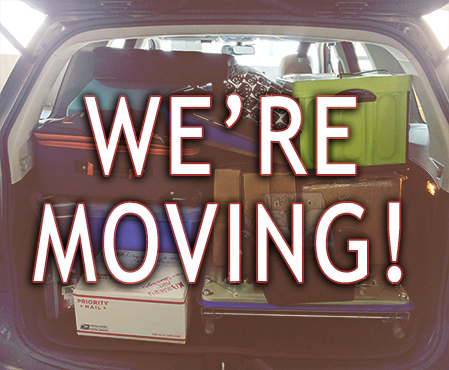 We'll be moving to the new house all during May, and then immediately after that is a convention month! Booth and table placements are not finalized yet but they will be updated on the event page when I get them. The Denver trip is always a long one, between 4+ days of travel, a full week in Denver, then visiting family for a full week means I won't be back in the studio until the end of June. I managed to get a little bit of footage from Sakura-Con to share, including some behind the scenes of setup.